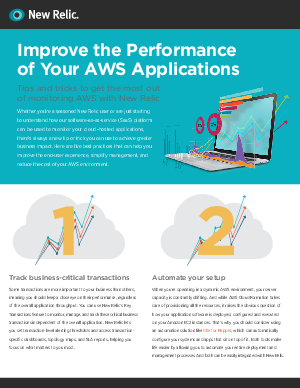 Whether you've already moved to the cloud or are ready to migrate, New Relic helps Amazon Web Services (AWS) users improve performance. Drawing on our deep cloud expertise and best practices we can offer to successfully migrate, operate, and optimize your cloud-hosted applications. Here are five best practices that can help you improve the end-user experience, simplify management, and reduce the cost of your AWS environment.